The best time to apply for a visa is approximately 4 weeks before traveling and 6 weeks if you apply by post. When applying for a visa at the Royal Thai Embassy, it is required that the applicants use and submit an application form from the Royal Thai Embassy only. Applicants are to bring the documents as listed in their subjected visa category along with the application form. Applications lacking any required documents will not be processed and will be returned to the applicant immediately. Submission of visa application along with the requested documents is ONLY between 09.00 hrs. – 11.30 hrs. from Monday to Friday(except official holidays). Any visa applications submitted at the Embassy after 11.30 hrs. will NOT be accepted. Collection of visa is ONLYbetween 14.00-16.00 hrs. Visa applications submitted at the Embassy in person will take approximately 3 working daysduring the low season (March – September) and up to 5 working days during the high season (October – February). The Embassy does not provide copy service and all copies must be made in A4 paper. For visa applications sent to the Embassy by post, all the required documents must be in order. Kindly enclose the visa fee in cashand a self-addressed envelope with appropriate postage (registered mail only) so that the Embassy can return the passport(s). Approximately postage stamp is 150 kr. Please contact Postnord for further information on postage stamps. Visa applications sent to the Embassy by post will take up to 15 working days (3 weeks) in all seasons. For postal visa applications sent to the Embassy from Iceland, Lithuania, Greenland and the Faroe Islands, visa fees are to be enclosed in Danish currency only. Travelers who reside in Denmark and are expected to travel within a short time frame are strongly advised to submit the visa applications to the Embassy in person. The validity of visa is 1 year. Travelers with this type of visa will be permitted to stay in Thailand for a period up to 1 year. DKK 1,250 for a multiple-entry. 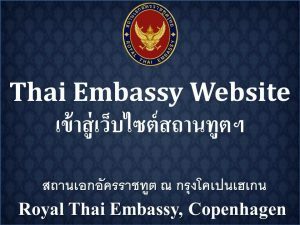 If application is submitted in person, visa processing fees are payable in cash or check issued by a Danish bank, payable to “The Royal Thai Embassy, Copenhagen”. If application is submitted by mail, please pay by BANK CHECK only. – When apply by mail , a self-addressed envelope with sufficient postage (Registered Mail ONLY) must be included for the return of passport. Please contact Post Danmark for further information on postage stamps. Visa processing fees are non-refundable and are subject to change without prior notice. Each applicant, including minor, is required to have his/her own passport to apply for a Thai visa at the Embassy or Consulate-General. Not being prohibited from entering the Kingdom under the Immigration Act. B.E. 2522. Having the nationality of or the residence in the country where his/ her application is submitted. 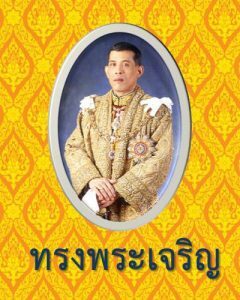 Having no criminal record against the security of Thailand and the country of his/her nationality, or the country of his/her residence. 2 copies of a passport (the picture page) with the original passport . In the case that the applicant wishes to have his/her spouse stay together in the Kingdom but his /her spouse is not qualified for the retirement visa, the spouse will be considered for the Non-Immigrant Visa Category “O”. 4 copies of a passport (the picture page) with the original passport (A passport valid at least 18 months) are required. Please note that the Embassy DOES NOT provide copy service !! Every 90 days, the alien must report to the Immigration office or the police station in the alien’s residence area. – In the case of conducting any following reports, the Reply Form for the pervious report must be enclosed. At the end of the one-year stay, the alien who wishes to extend his/her stay must submit a request to the Immigration Bureau with the documented evidence of money transfer /or a deposit account in the Kingdom /or an income certificate at the amount of no less than 800,000 Baht /or an income certificate plus a deposit account at the total amount of no less than 800,000 Baht a year. The marriage certificate must be presented, if the alien’s spouse wishes to extend his/her stay. Regulations are subject to change without notice. Consular officers reserve the right to request additional documents as deemed necessary. Consular officers assume the right to deny or grant any type of visa to the applicant. Visa application fee is non-refundable and may be changed without prior notice.